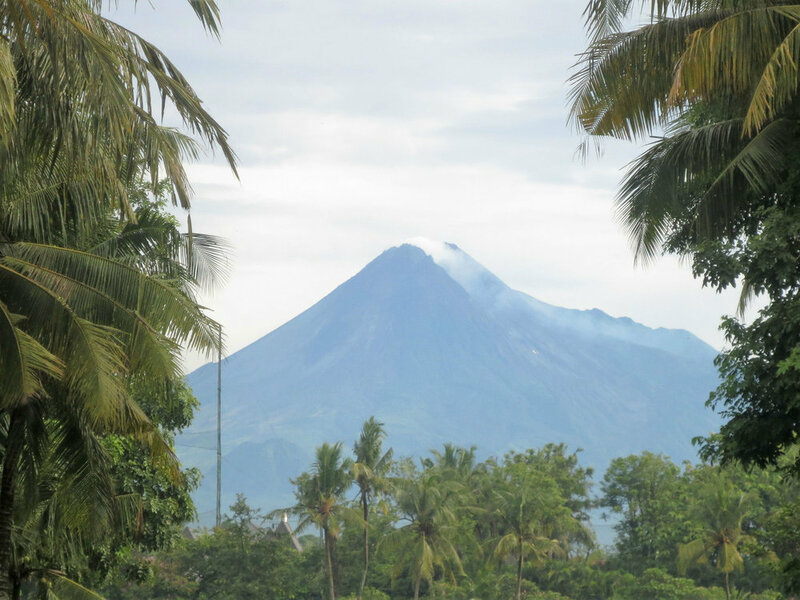 We travelled to the island of Java, Indonesia to climb one of it’s 40 still active volcanos. Our adventure started in the city of Yogyakarta. Francien and I caught the train to Banyuwangi. 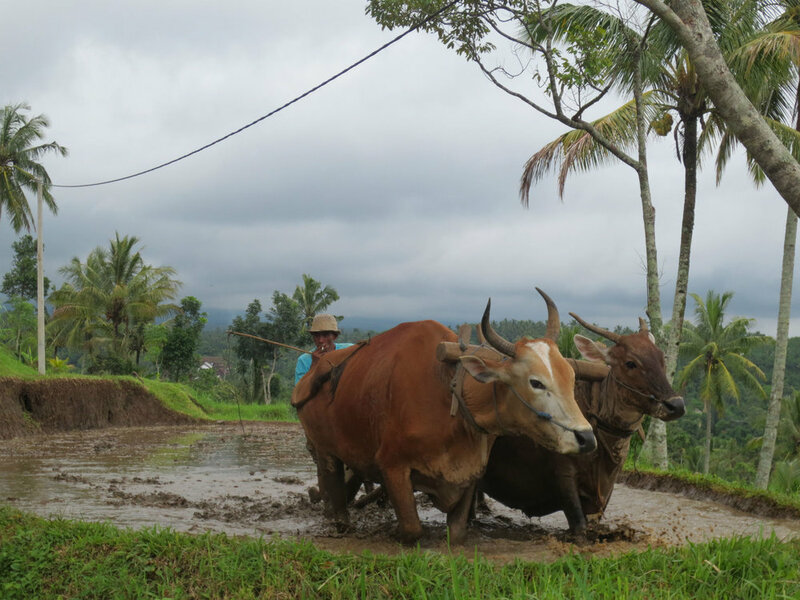 The 600 Km trip took us 14 hours crossing the middle of Java to its most eastern tip. Except for two western backpackers, we were the only foreigners in the full train. The rail had one track, so a few times we had to wait up to fifteen minutes to let an approaching train pass. I joined some of the passengers to step out to stretch the legs and get some fresh air until the train horn signalled the journey would continue. We sat on cramped benches facing with our knees against a family with two small children. The mother wore an abaya, gloves and black socks and at noon sat herself cross legged on the bench facing west to pray. There was a trash bin in in the middle of the isle, the air-co was leaking, the squat toilettes dirty and the kitchen in which the nasi goring was prepared looked rather adventurous. The conductor checked the tickets of the new passengers, escorted by two policemen. Half of the rail crossings were still manned and uniformed station masters were in charge of the platforms. Dispatchers manually operated the switches. I felt as though we had travelled back in time. As far as the eye could see the vegetation was lush and green. At anytime we could see at least one volcanic mountain as we travelled east. Living conditions of the people increasingly looked more impoverished: brick buildings made way to bamboo huts lining the rail track, people washing themselves in rivers, children playing in the mud, buffalo's ploughed the paddy fields cladding the slopes of so many volcanos. Ten minutes before we arrived in Banyuwangi the conductor gestured we take our luggage and move to the front of the train; as nobody spoke English we could not find out why! But we understood once we stepped out of the train: the platform in Banyuwangi was too short! 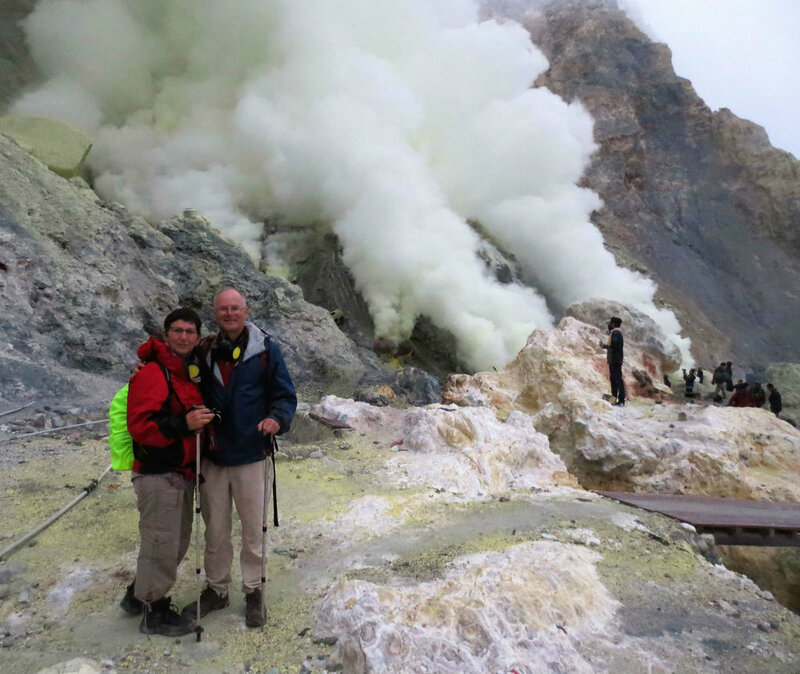 We came here to climb the active Ijen volcano (at least once a year people are evacuated around the mountain due to increased seismic activities and occasional underwater explosions). 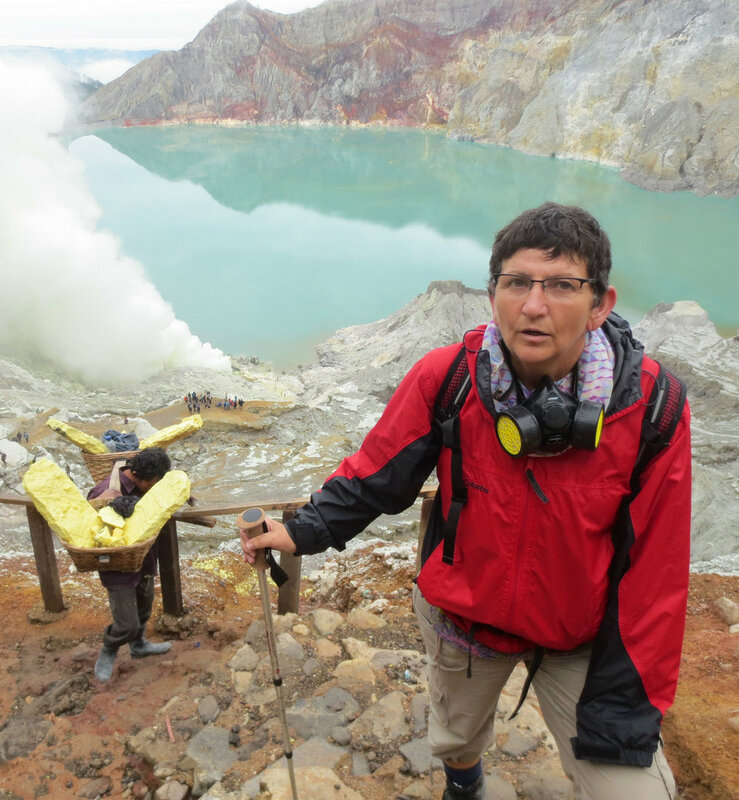 With our local guide Iban, Francien and I started hiking in the middle of the night at an altitude of 1800 meters up a steep well-trodden gravel path to the rim of the 2300 meters high crater. We wore headlights, backpacks with water and spare cloth, and jackets to keep warm as the temperature had dropped to ten degrees. 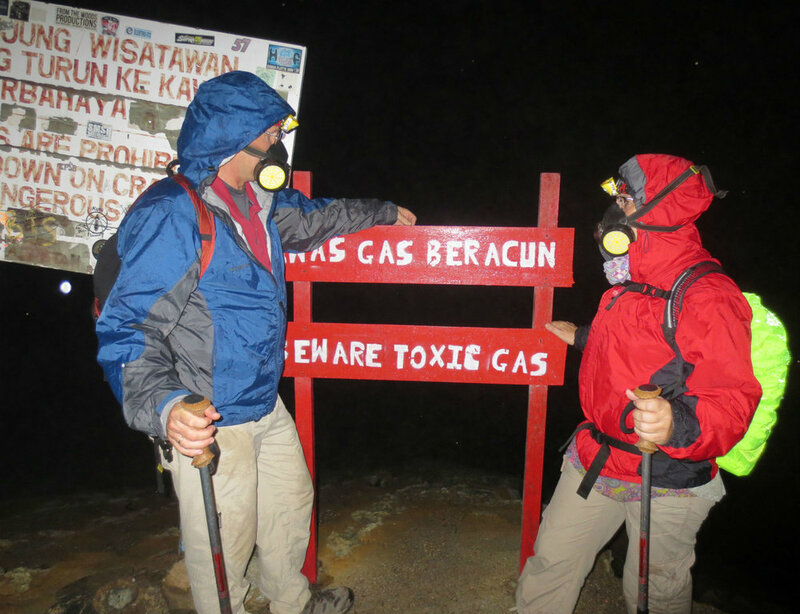 When we reached the summit Iban said: 'put on your gas masks'. 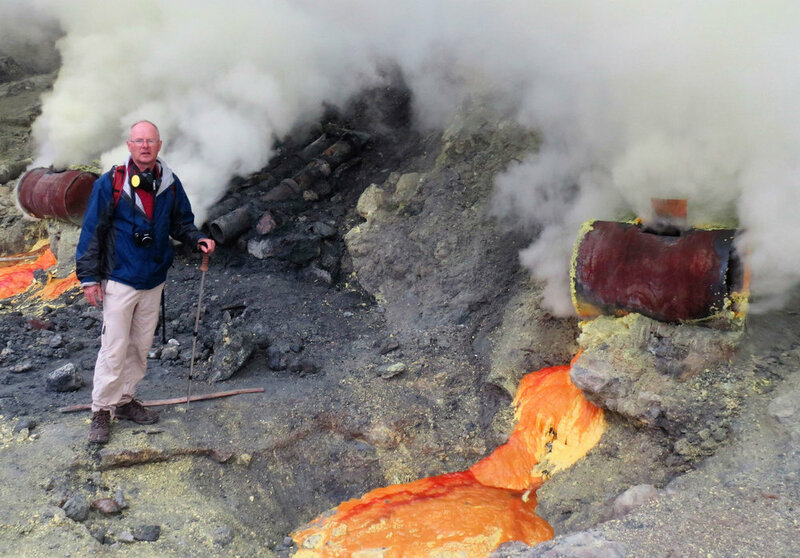 We gladly did as the foul smell of rotten eggs came out of the crater: sulphur….! Warning signs 'toxic gas!'. After a brief rest we descended 400 meters into the noxious crater on slippery smooth faced rocks. It was pitch dark and we scrambled down using our hands. Fortunately I could not see the steep drops next to the path considering my altogether bad balance! After one hour we reached the shore of an acid lake at the bottom. Immediately we had to cover our eyes every few minutes as biting fumes wafted into our faces. Let me tell you, this is when it felt really claustrophobic! Each time we could not move until the suffocating cloud was gone. At the edge of the lake elemental sulphur vented and burned as a five meters high blue flame. Every few minutes we saw this fleeting flame (which can only be seen at night) from behind the billowing steaming clouds. As the sun rose, the thick clouds became visible as crimson coloured towers, threatening, rising from the yellowish rocks towards the crater rim, now high above us. It was creepy standing next to the turquoise coloured and hot acid lake (1 km circumference, 200 meters deep, making it the largest acid lake in the world), at the bottom of the bare crater. We watched local miners breaking up the putrid yellow sulphur rocks and carry up to 50 cm long yellow chunks in two woven baskets on their shoulders, each weighing up to 35 kg! We took pictures but the lens of our camera fogged up. I tried to understand in what kind of hostile environment we were: this was the most inhospitable place we had ever been! Back on the crater rim at full daylight we finally took off our masks and proudly watched down on the crater lake, partly covered by billowing brown fumes. Looking the other way, a commanding view across the fresh and verdant volcanic mountains of eastern Java. Woow, how much we enjoyed this clean air! However, the taste of rotten eggs in our mouth’s lingered on for a few days; a small price we had to pay for a unique experience!